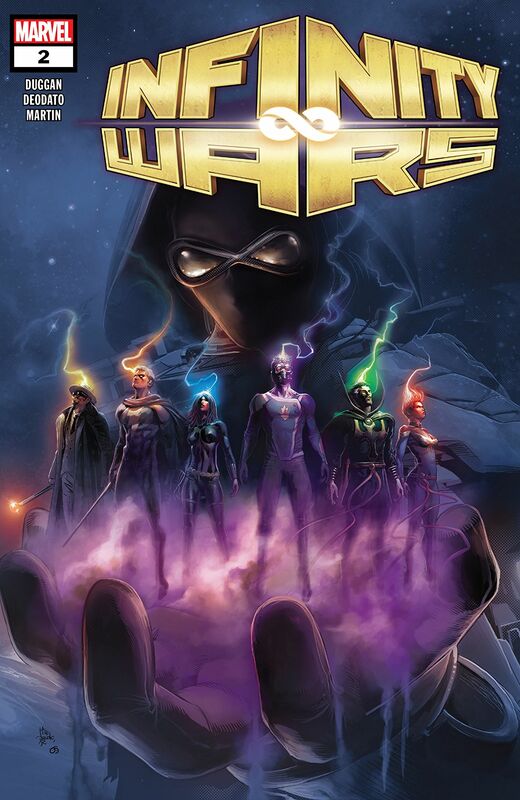 Infinity Wars #2 review: What would you do… – AiPT! Raises the stakes for the entire Marvel Universe, pitting Thanos’ legacy against the might of Earth’s Mightiest Heroes. If part of you were trapped beyond reach, if a portion of your soul was ripped from you, how far would you go to get it back? What lines would you cross? As big as Marvel’s Infinity Wars will get, the story boils down to a very small, but significant, question. What would you do to be yourself again? After quickly discovering that the newest danger in the Marvel Universe, Requiem, is really favorite daughter of Thanos, Gamora, writer Gerry Duggan showed us exactly how far she is willing to go to recover the piece of her being trapped in the Soul Stone. Killing Peter Quill, especially using the very sword, enhanced by the Power Stone, that she used to behead the Mad Titan, paints a clear and distinct change in not only the Guardians of the Galaxy, but also the balance of the entire universe. While a bit of time shifting from Doctor Strange fixes this first major moment, Gamora wastes no time in collecting the remainder of the Infinity Stones that have been collected on Earth. This, of course, was what Strange wanted to prevent. While he convinces the newly wealthy Tusk to relinquish the Mind Stone, Gamora is three steps ahead at all times. Her constant, determinative personality that has given the Guardians so much success is now turned against the team as well as Earth’s Mightiest Heroes. With the voice of Thanos in her head – real or imagined – she is driven towards her singular goal. Artist Mike Deodato, Jr., along with color artist Frank Martin, has put together a dynamic and intense comic highlighting not just the intensity of the moment, but the darkness swirling around and inside Gamora herself. The flashback at the outset burns with color, ending with the sheer enormity of Thanos looking down at young Gamora, predicting his own death at her hands. The parallel of that scene and the flashback to his actual death are gorgeous in their ferocity and brutality. I am, again, drawn to the paneling of this comic in exactly the opposite way that Russell Dauterman’s work on Mighty Thor attracted me. Dauterman worked in abstractness of panels, stretching the concept to extremes, while Deodato seems to revel in the straight lines and blank spaces that dissect full page spreads. Gamora standing, resplendent in her Requiem armor (if there aren’t amazing cosplays of this page this con season, I’m going to be sorely disappointed) evokes the feeling of Hamlet as Gamora stares into the dead eyes of her father, his head in her hand. While I hold cautious optimism about this series considering the bang-up start it has had, I am concerned about how far it will be allowed to go. Is this a permanent sea change for the Marvel Universe, or will we find in issue #6 that it was all some kind of Elseworld/Dallas dream sequence? Given what has happened already and the speed with which it happened, I hope we’re seeing a real change in the future of the heroes involved as well as the larger Marvel Universe going forward. While I hold cautious optimism about this series considering the bang-up start it has had, I am concerned about how far it will be allowed to go. Is this a permanent sea change for the Marvel Universe, or will we find in issue #6 that it was all some kind of Elseworld/Dallas dream sequence? Given what has happened already and the speed with which it happened, I hope we're seeing a real change in the future of the heroes involved as well as the larger Marvel Universe going forward. Is this going to go as far as it could, or will it be reined in before the end?